"The Top of My List"
I was walking up the stairwell to the Library of Congress reading room with two 50-something women in jeans outfits and baseball caps. They were going to get library cards. One said to me: "It's pretty great that we can get library cards from The Library of Congress!" The other said: "It's at the top of my list!" He shows the variety of ways that people use public libraries and how libraries are precious social infrastructures for civil society. 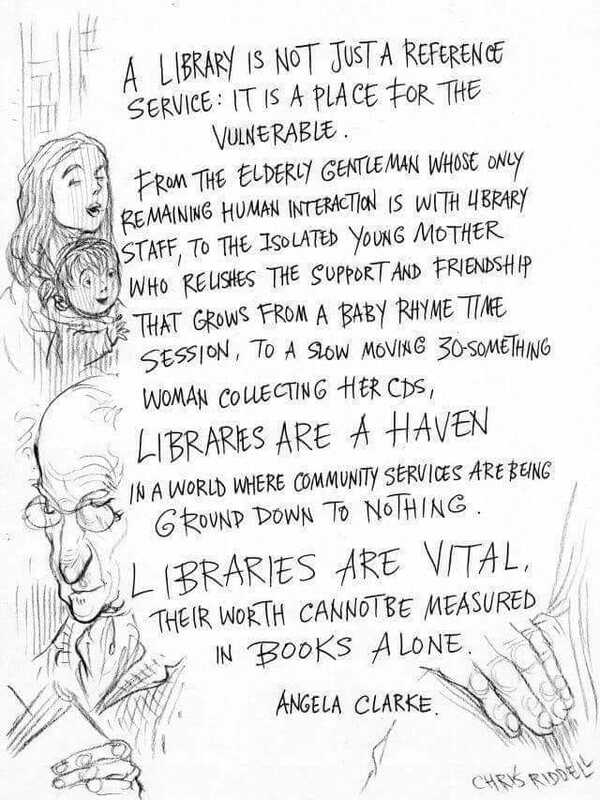 Last night I was told by someone who works for a public library that I should write the librarians and tell them why I value the library so much. 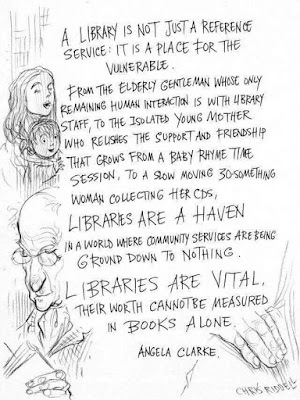 Join me and write letters to your public libraries letting them know why you value them! "The people in the Price Hill community rely on the library not only as a point of access to needed information, resources and entertainment, but also a respite from a stressful existence as well as a place to gather. When people walk up the steps and through the door, this is what they carry with them, this is what they seek, and this is what we try our best to provide." "For those of you in Cincinnati, voting starts April 10th and Election Day is May 8th. If you value the important and inherently radical work that library workers perform every day, I urge you to publicly share your support for Issue 3, and, of course, VOTE!" I just read Rebecca Lossin's "Against the Universal Library." Lossin argues that librarians have come to hate paper, which is fully realized in the destruction of books (and newspapers, which is disconcerting because there are often fewer saved copies in libraries) to scan them and is symbolically expressed in the names like Kindle and Kindle Fire. This is effectively the burning of books in the name of "inevitable" technological progress. The Library of Congress has taken part in this destruction process by pioneering processes that destroy books. Libraries are now "becoming something other than a library -- a brick-and-mortar portal into the private sector." Lossin concludes, "Digitization, and the digitization of books in particular, is not benign. In both its utopian and pragmatic forms, digitization conceals a destructive impulse that not only eliminates books but threatens the very freedom of discourse it purports to promote; erodes the educational and experiences of those it claims to support; and monetizes, thus commodifies, intellectual life in the name of free access. And all of this dramatically alters the writing it contains, if it doesn't practically erase it." The best thing about a printed book, however, is what it does not do. I cannot use it to watch television or check my email. My mother will never call me on it. My boss will never use it to interrupt me. In an age of constant media distractions, having a single object dedicated to a single activity -- reading -- is increasingly important. To sit and read, especially in a peaceful, quiet public library with others, is truly a wonderful experience. Maybe I should now say that the Library of Congress is the greatest! by President Barack Obama and was confirmed by the U.S. Senate. The feed begins at 11 a.m. EDT here, and the ceremony begins at noon EDT. Applications are now welcomed for "The Library of Congress is Great" Scholar-in-Residence Program. 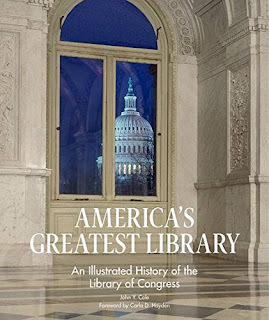 Scholars in residence must have a Library of Congress Reader Identification Card and thus, as a result, have all the benefits of being a reader in the Library of Congress. The residency does not provide housing, stipend, or salary of any kind. Join the illustrious "Library of Congress is Great" Scholar-in-Residence Program! Please submit your application (or any questions) below as a comment. By Popular Demand: Writing Retreat Extended! Yes, due to popular demand, the Second Annual Library of Congress Writing Retreat has been extended another week, so we'll be in writing action through Friday, May 27th. Feel free to post your writing plans/commitments below. For more info on the Writing Retreat, see here. Everyone is invited to the Second Annual Library of Congress Writing Retreat: Monday, May 16th to Friday, May 20th 8:30am to 5pm (self-funded lunch 12-12:30 in the 6th floor cafeteria in the Madison Building). Free and open to anyone 18 years of age or older. The main activity: writing without distractions, getting writing projects done, writing with joy, or whatever makes sense to you. The only requirements are that, before you arrive on Monday morning, you have a specific writing goal or specific set of writing goals for the week and that you make some sort of time commitment to the writing retreat (for example, writing in the Library of Congress all five days or four out of the five days or whatever you wish). 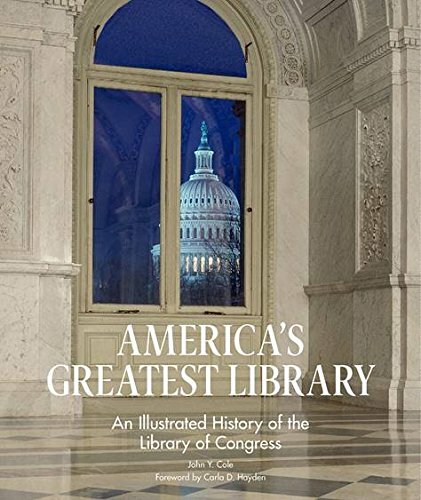 In addition, the Library of Congress requires that you obtain a library card before going into the reading rooms. For those who wish to meet for lunch, we can talk about our writing plans, etc. Finally, it would be great if you would comment on this blog post, letting me know if you are planning to take part and maybe your personal writing goals for the week. Of course, those having their own writing retreats in other wonderful public libraries around the world can comment and let us know the details of their own writing retreat. Today, during a break from writing in the European Reading Room, I got some peanuts from the machines right below the Jefferson Building cloak room and then waltzed right into the Southwest Courtyard. It is looking great. Lots of flowers. Everything has been spruced up. Happy Opening Day! The Library of Congress Chorale is a recognized employee organization of the Library of Congress. Membership is open to all members of the Library community, including staff, contractors, researchers, volunteers, and staff of other Capitol Hillarea government agencies. Conductors are chosen for a two-year term from among interested employees. The Chorale performs two formal concerts each year, in December and May or June. It also supports special events, such as the Librarian of Congress' annual holiday celebration in the Great Hall. Rehearsals take place weekly, on Wednesdays (12:05-1:00pm), from September to June. If you enjoy singing, please consider joining us for the spring program. Questions may be directed to David Brunton, President, Library of Congress Chorale (dbrun@loc.gov or 202-707-2790). What a trip — and it’s just beginning. in 1937, when the Library began to establish a poetry presence in the Nation’s Capital, thanks to a gift from railroad heir Archer M. Huntington, who wrote poetry himself. 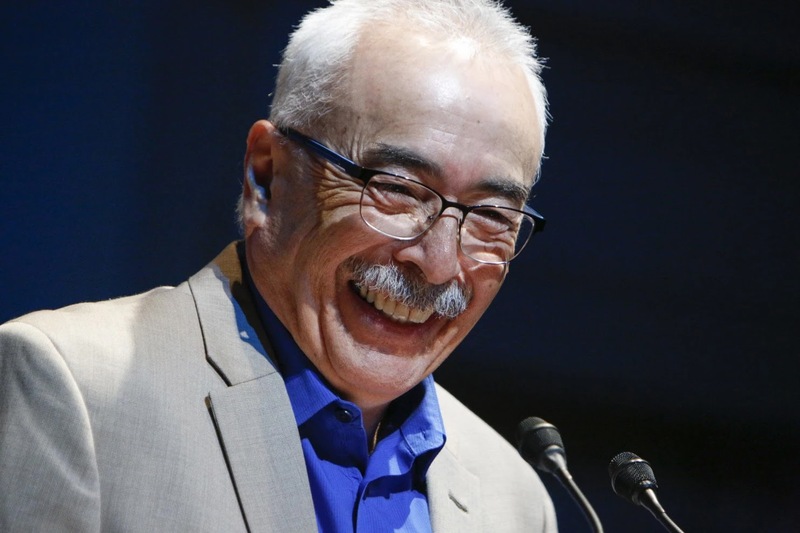 Huntington funded the “Chair in English Poetry,” a position which evolved into “Poetry Consultant to the Library of Congress,” and finally, in 1987, into “Poet Laureate/Consultant to the Library”—or just, casually, US Poet Laureate. The Library of Congress is part of the vibrant worldwide poetry world and has a Poetry Office. Another reason that the Library of Congress is great! Anyone 16 and over can get a library card, which allows you into the Library's reading rooms. Click here to find out how to get a library card. Who is working in the Reading Rooms? Johanna Bockman, Michael David-Fox, Steven Harris, Marcy Norton, Arpad von Klimo, Jacob Melish, Paul Miller, Bernardo Piciché. Chris Moore, David Sartorius, Julia Young. Maud Casey, Emily Landau, Paul Landau, Sam Lebovic, Sara Scalenghe, Dan Schwarz, Jonathan Skolnik, Andrew Zimmerman. Have you sighted someone in a RR? Let me know: johanna.bockman@gmail.com. Jorge Luis Borges said, "I have always imagined that Paradise will be a kind of library."